If you're interested in The Wolf Among Us but don't want to commit to a season pass, you can try out the first episode free! 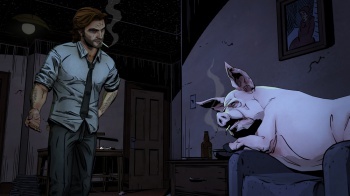 Just a quick heads-up for you guys, if you are at all interested in Telltale Game's The Wolf Among Us, and you happen to be an Xbox 360 gamer, you can now head over to the XBLA store and download the first episode of the series completely free. If you enjoy it, you can then go ahead and pick up a season pass, which contains all five episodes of the first season, for just $14.99. The Wolf Among Us is an ongoing episodic graphic adventure based on Bill Willingham's Fables comic book series. Currently, only the first episode of Season 1 has been released, with the remaining four due for release sometime in 2014. The game plays very similarly to Telltale's surprise hit: The Walking Dead, and it has similarly mature themes within it. Those of you who became Telltale fans due to The Walking Dead should definitely check this one out, especially considering it is free! Just like in The Walking Dead, the decisions you make in The Wolf Among Us will effect the outcome of the story, both in the first episode and in subsequent episodes. The game is also available on PC, OS X, iOS, PlayStation 3 and PlayStation Vita, via their respective online stores.